A town hall webcast can be affordable, painless and effective in establishing immediate and compelling communication with your workforce. 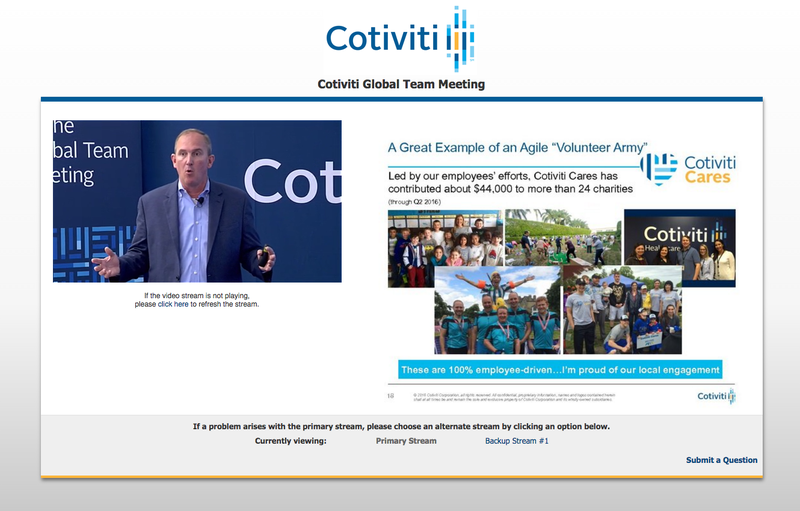 Reaching across borders and oceans a Town Hall webcast keeps your team informed, and feeling included in the growth of your company. Report financials, deploy new initiatives, announce product updates, establish new policies, executive announcements and train live. Use the VOD (Video-on-Demand) archive webcasting we offer as part of our webcasting services to build a library of your webcast and video production content. 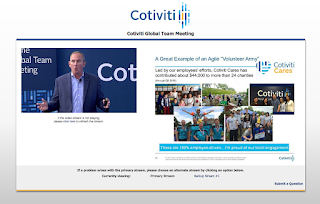 Cotiviti uses the ICV Media Portal to retain a streaming video archive of townhall webcasts and other company webcasts. User access is easily and securely managed. You can share or embed your webcasts in your intranet or corporate site. Webcast events and conferences to your customers or the public. Using our Mobile Video Flypacks with Ki-pros, Panasonic HS-50 switchers and our HPX500 Cameras, webcasting setup is greatly simplified. Getting online and streaming for an event such as an industry conference or panel? Webcast it live with our Flypacks. You receive a complete Single Price webcasting package including the live webcast and an on-demand streaming video archive. Our webcast services include all staff, all video gear, our custom web development, hosting and all technology requirements. Live Webcasting when you need it, where you need it anywhere in the San Francisco Bay Area and beyond. We webcast around the country and around the world. Learn more about our fast, flexible live webcasting services and our webcasting Mobile Video Production Racks – Flypacks at www.townhallwebcasts.com.